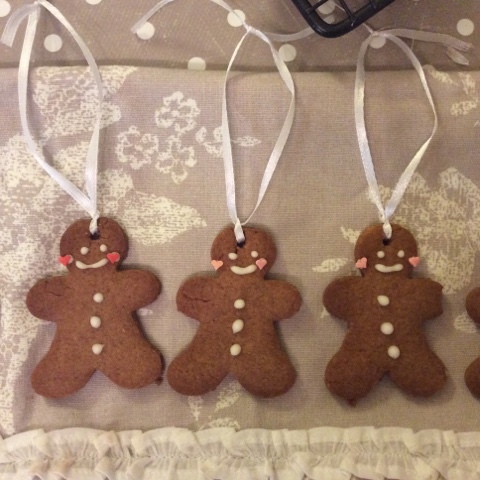 Well it's Christmas over load on the baking front in my kitchen, my Christmas cakes & plum puds are baked for my customers & family so I thought I'd start my edible gift blogs for this year. 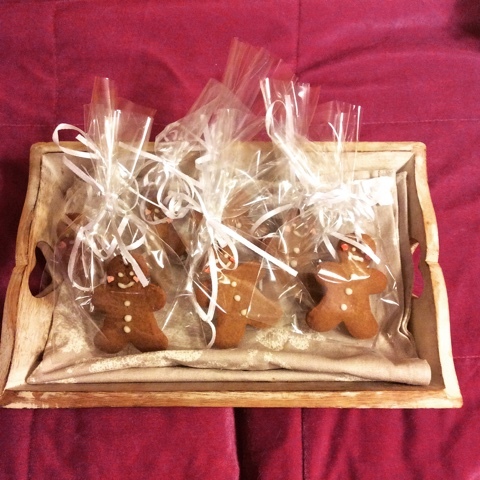 Kicking off the edible ideas is my scrummy gingerbread men and there naff gaff the gingerbread house. 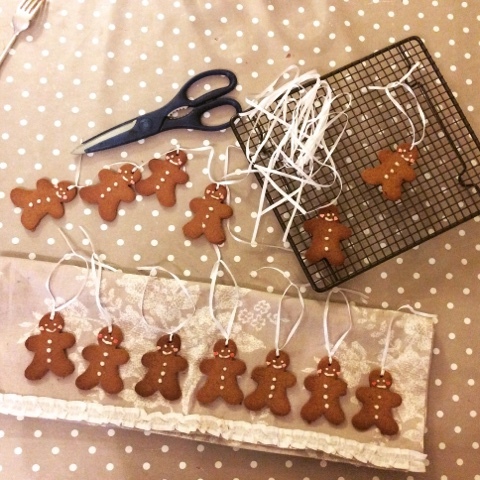 This recipe will make a whopping 60 ginger bread men or a house and approx 25 gingerbread men. 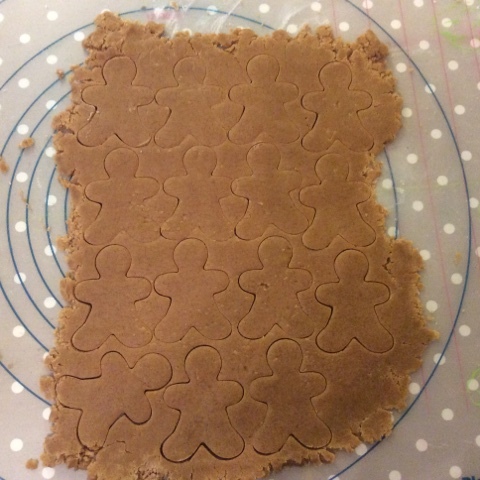 I bought my gingerbread 3D cookie cutter from Aldi and it cost €4.99 I also bought my gingerbread cookie cutters from Supervalue and the cost just under €3. Pre heat your oven to 180'c. In a pot melt the butter, sugar and golden syrup together, in a large bowl sift together the flour, baking soda & ground ginger. Pour the butter mixture in the flour and mix together until it forms a firm dough ball, wrap in cling film and pop in the fridge until it has cooled and has time to firm up. Flour your work surface liberally and proceed to roll out your cookie dough making sure to flour your rolling pin. I recommend rolling the dough out to the thickness of a €2 coin as when baked the dough can puff up slightly. This dough can be crumbly so don't be frightened if it seems to break apart when you roll it out. 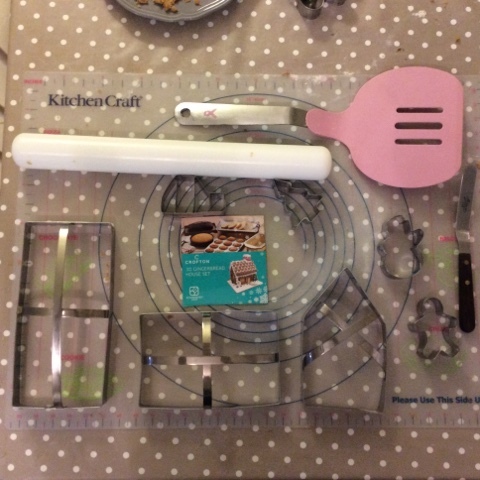 I found if you persuade it back into shape with your fingers it will hold that shape to the very end of the bake. 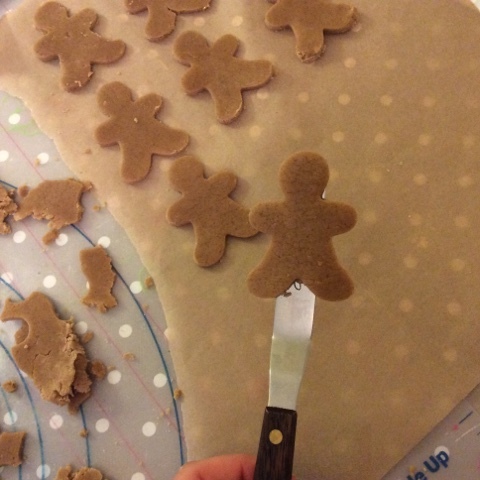 Cut out your gingerbread army or your house and place them on your lined baking sheet, then pop back in the fridge to harden up again. 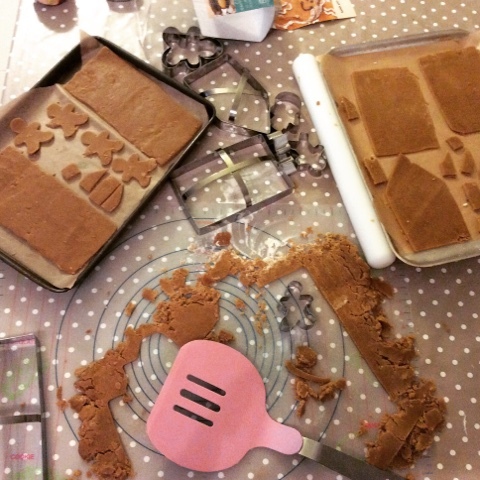 This is the best way to keep your cookies shape. 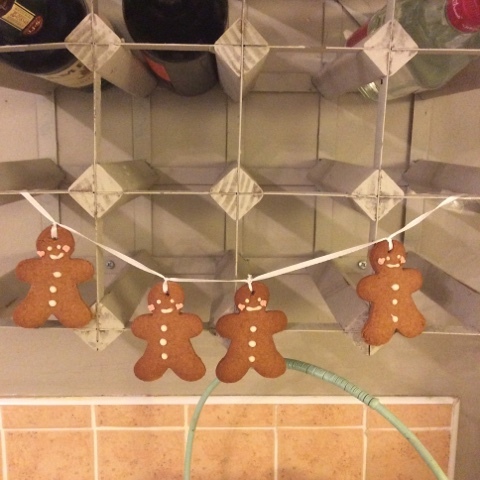 I made little holes at the top of the gingerbread men's head before I baked them to tie ribbon through to hang on the Christmas trees. Bake for 15mins then let cool on a cooling rack. While they are cooling make your royal icing by whisking the egg white until white and frothy then add in the icing sugar and whisk until smooth. 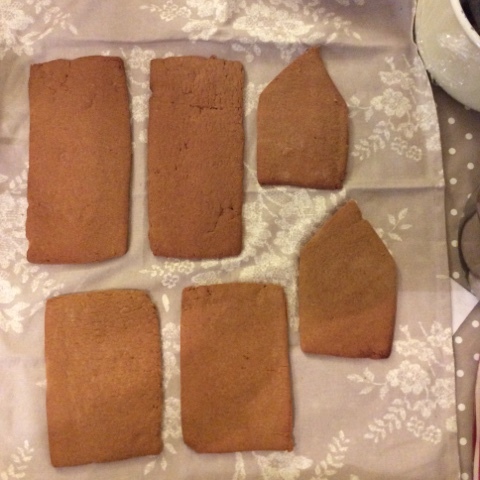 You want the Royal icing to be quite stiff so it acts like a glue to hold the walls of the house together. You will need at least 4 cups or glasses to help support your house as you assemble it. Scoop the Royal icing into a piping bag snip the tip and use it as you would glue. When I had the walls stuck together I went back over the seams with the "glue" to ensure they were well supported. The roof will be the trickiest part to add to the house. 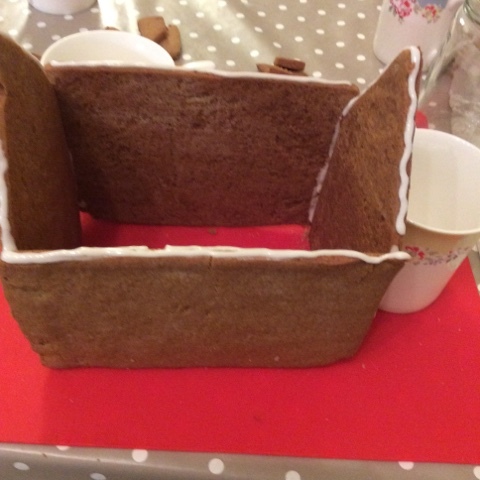 I ran glue along all the edges of the tops of the walls popped the roof on then supported the end of the roof with the cups to prevent it from sliding off, this is why you need the "glue" to stiff so it feels like it has set instantly. Once the house has successfully stayed in place now the fun begins. Pipe on the windows & doors your can even pipe on the slates on the roof. Use all kinds of candy as decoration for the house, think Hanzel & Grettal when designing it. 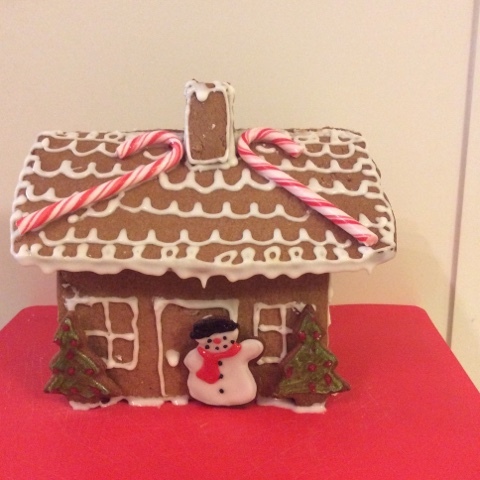 Both the gingerbread men & the house keep really well in the fridge & freezer. Have fun making these the smell alone will make the process worth it.